Millennia ago, the demon Nysrog was defeated and sent back to the hell from which he arose. But some of his followers survived, and now the Tainted Cabal may be stirring. While society at large has forgotten the devastation of that final battle, the churches and the sorcerers remember, and will do anything to prevent Nysrog from rising again. When an ancient ruin is uncovered near a northern settlement, the Church of Menselas and the Church of the Lady Sylva Kalisia form an uneasy alliance to protect the villagers from the stream of Dead Eyes unleashed by the breach of the ruin. But each member of the party has their own secrets and motivations that may endanger the mission, and perhaps the world itself. 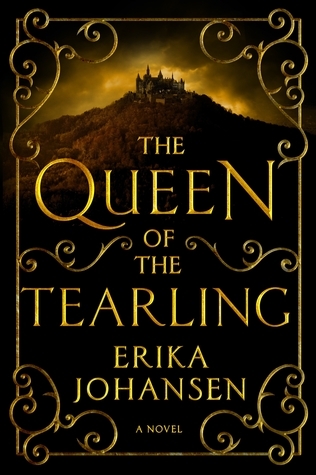 I got off to a bit of a rough start with this novel, which opens in the perspective of Niklaus, the Chosen Sword of the goddess known as the Lady Sylva Kalisia. Niklaus has served the goddess for centuries, and dreams of becoming a god himself so that he can join her as her consort. His sexual motivations are extremely skeevy, and I didn’t particularly enjoy being in his point of view. Fortunately, Niklaus is only one of many narrative perspectives in the story, so I didn’t have to be constantly in his head, up close and personal with his sexual fantasies, which might have been a deal breaker. The other dominant point of view belongs to Aldric Kermoran, who is both touched by the god Menselas, and is also a sorcerer, though his church tends to shun sorcery, and view him as cursed. He dreams of being a healer, but he is frequently tasked with the Church’s dirtier deeds, and worries he will never be allowed to settle down and hone his craft. His ability as a sorcerer has been hampered by the Church’s teachings, as he believes he should only use his dawn-tide power, and shun the dusk-tide, even though almost all powerful sorcery requires the use of both. However, meeting the sorcerer Soki in Caronath causes him to begin questioning this divide. Though obviously a master of her massive dusk-tide power, the more Aldric gets to know Soki, the more sure he is that she is not evil. And he may need his dusk-tide power in order to survive what is to come. The odd woman out is Kurio, a nobleman’s daughter who escaped an abusive home life, and survives on her wits and thievery in Caronath’s underworld. Though her perspective is present from early on, Kurio’s exact relationship to the rest of the story is unclear for much of the book. Obviously she is on a collision course with the main narrative, but how precisely she fits in is slowly pieced together. Her journey begins when she is hired to steal a magical artefact that turns out to be more trouble than it was worth. One of Hogan’s great strengths as a writer, as I noted in my reviews of his previous book, Blood of Innocents, is his ability to build his narratives around groups of characters who are bound together by a common cause, yet have a turbulent alliance that could collapse at any moment. Niklaus and Aldric’s churches do not traditionally get along, and the two men could not be more different. Joining their group is Valeria, a high priestess of Sylva Kalisia, who resents Niklaus’ position in the church. Two mercenaries seem to be driven mostly by a desire for treasure and adventure, while Razmus and his sorcerer daughter Priska are at odds with one another. Priska is torn between interest in learning more about Valeria’s church, and learning to better master her sorcery from Sokhelle, who is a powerful sorcerer in her own right, as well as Aldric’s not-so-secret love interest. Revenant Winds also features an interesting interplay between magic systems. First we have the sorcerers, whose magic is based on mathematical calculations, and the power of sunrise and sunset. The god-touched require no such devices, but their powers are much more limited in scope, depending on the aspects of their god or goddess. Aldric can use his god’s power to heal, while Valeria can call upon her goddess to inflict pain. Finally, there seems to be a third type of power, demon magic, distinct from the other two types of power. The demonic power is less explored in this volume, since the demons are largely hiding in the shadows, but look set to play a larger role in future installments. Revenant Winds is a strong series starter with interesting characters, an intriguing magic system, and ample room for more world-building as the story continues. Unfortunately for me, my favourite character looks to be dead heading into book two, but that isn’t going to stop me from awaiting the next installment in the series. Disclaimer: I received a free review copy of this book as part of the Harper Voyager Super Reader program. After being forced to leave the monastery where he was raised, Caldan thought he had found a new place among the Protectors of Anasoma, where his skills for sorcery and swordsmanship would be put to good use. But Anasoma has been invaded by the Indryallans, the Protectors are dead, and Miranda’s mind has been damaged by coercive sorcery in the escape from the city. Accompanied by the shopkeeper, Amerdan, and Elpidia, the healer, Caldan sets out for the nearest city, Riversedge, where he hopes to warn the remaining Protectors and get a message to the Emperor about what has befallen Anasoma. Blood of Innocents was self-published by Mitchell Hogan in 2014, and has been edited and re-released by Harper Voyager. Many fantasy novels centre on a band of friends who set out on, or are forced into, an adventure. Often there are tensions within the group, but they remain largely amicable. However, Hogan has chosen to upend that trope, casting Caldan’s lot in with an ever-shifting group of uneasy allies, none of whom can quite trust one another. Bells remains a wily and powerful enemy sorcerer despite her confinement, Amerdan is still harbouring dark secrets, and Elpidia’s ulterior motives are all too evident. Miranda could theoretically be trusted, but she is still incapacitated by the coercive sorcery that damaged her mind, perhaps irrevocably. The result keeps the reader constantly on edge, even when the hero is supposedly among friends. Miranda was one of the characters I was intrigued to learn more about after A Crucible of Souls, but unfortunately she isn’t really a character in Blood of Innocents. She has been entirely deprived of her personality in order to motivate Caldan, who is willing to do anything, even break the rules about studying coercive sorcery, in order to save her. This means that Miranda is essentially a plot device rather than person in this book. We do get to continue to learn more about some of the secondary characters, however. Vasile, the magistrate who can detect lies, has been brought together with Aidan and his band of hunters, and joined up in an uneasy alliance with Gazija, the mysterious First Deliverer. Meanwhile, Lady Felice remains trapped inside Anasoma, where she attempts to mount a resistance against Indryalla, and its God-Emperor, Kelhak. Hogan continues to alternate between chapters following these players, and chapters about Caldan and his fellows. Whereas the secondary perspectives were quite disconnected from Caldan in A Crucible of Souls, the threads are finally beginning to converge in this volume. If A Crucible of Souls was about setting up the magic system, Blood of Innocents is about expanding and bending it. Although Caldan has come a long way since leaving the monastery, his new view of the world forces him to begin realizing how little he knows, and perhaps how much is being deliberately kept secret. Rules of magic that he has always taken for granted come into question as he encounters foreign practitioners, and sorcerers from the highest levels of the Mahruse Empire. Each new encounter strips away more of his naïveté and innocence, but often not until after he has gotten into significant trouble as a result of his trusting nature. But Caldan has finally glimpsed the magnitude of the two powers he is caught between, and the stage is set for a face-off in which he will be hard-pressed not to be crushed between giants. Disclaimer: I received a free review copy of this book from the publisher. All quotes are based on an uncorrected text. Seventeen-year-old Caldan is an orphan who has been raised by monks in a monastery that serves as expensive private school for the children of the Empire’s elite. When a fight with a student turns unexpectedly serious, Caldan finds himself being put off the island a month before he comes of age. Before he leaves, the monks give him his inheritance; two rings, one of which is a trinket, or magical artifact with unknown powers. They also tell him that his parents may have died because of the rings. Alone in the unfamiliar city of Anasoma, Caldan struggles to navigate the world for the first time, and find a place for himself in it. 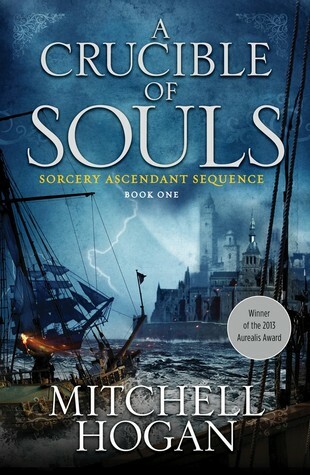 Though he is skilled at sorcery, swordplay, and the popular game of Dominion, it may not be enough to gain him admittance into the secretive Sorcerer’s Guild, where he may find answers about what happened to his parents. Originally self-published in 2013, A Crucible of Souls and its sequels have been picked up by Harper Voyager for print publication. Author Mitchell Hogan cites the inspiration of J.R.R. Tolkien in his biography, and his work employs many of the traditional tropes and forms of high fantasy, and will feel comfortable and familiar to readers of that genre. As the first volume in a trilogy, A Crucible of Souls is understandably heavy on world-building and exposition. The characters are varied and intriguing, with women occupying a number of positions of power, though one minor female character was unequivocally fridged to motivate Caldan. I look forward to seeing more of Lady Felice and perhaps Captain Charlotte, as well as finding out more about Miranda. Caldan is an insightful character who can see how things fit together, but only when he understands how things work. Though he is a skilled Dominion player (Hogan’s fantastical version of chess played on a three-tiered board) he is too naïve and inexperienced to always be able to translate this skill into the real world where it would benefit him greatly. Character development is somewhat hampered by the often stilted conversations that accompany their interactions; dialogue is not one of Hogan’s strengths. The stand-out element here is the varied and flexible magical system that mixes in elements of alchemy, and varies from person to person. Artifacts are important, and while I thought trinket was a rather trivial word to use to describe powerful magical objects, they do have interesting potential. Everything from paper, to wood, to metal can be used to harness magic for some period of time, but the knowledge of how to make artifacts (trinkets) that do not disintegrate has been lost. Although legends from before the Shattering suggest that it is possible to use magic for war and destruction, sorcery as Caldan knows it is a purely creative force with a limited life span. Interspersed with Caldan’s narration are other chapters from a variety of perspectives, the connection to which is not immediately clear. There is a magistrate who can always tell when he is being lied to, a crusader who believes that the leader of his band is losing her mind, and a shopkeeper with a dark secret. Since Caldan’s tale is slow to start, these chapters provide an opportunity for some action, and also allow Hogan to set out information and perspectives beyond Caldan’s limited experience and knowledge. The story drives towards revealing the connection between the disparate characters, and it is when they begin to move towards one another that the plot picks up steam, setting the stage for the sequel. A Crucible of Souls is a promising start with a few snags, but it really all depends on where we go from here.